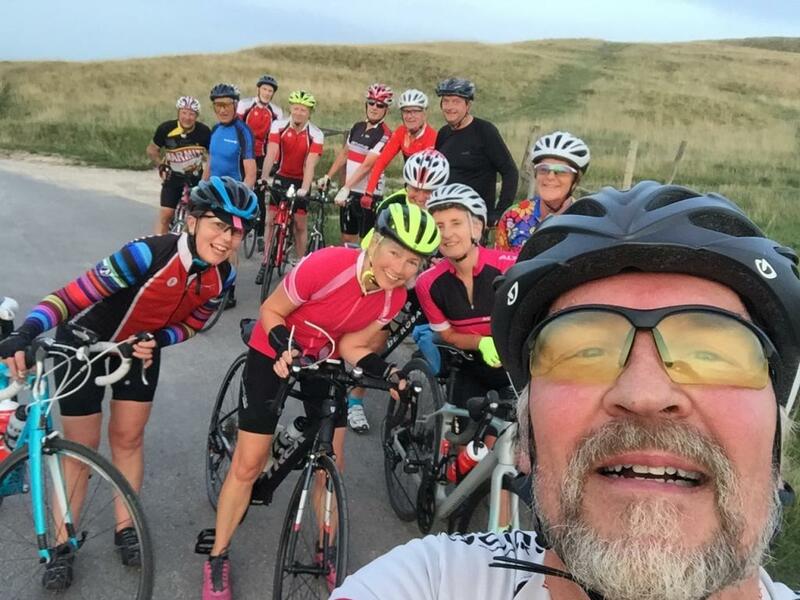 OK, for the last of these season's Tuesday evening rides we will head out to White Horse Hill for one last sunset (hopefully!). Due to light and time pressures we'll take the shortest route out via Denchworth, Goosey, Baulking lane and Uffington, returning pretty much the same route in reverse. At 35k this should get us back before 20.00 shortly after sunset. However, lights will be essential in case of delays to the return. A group of 14 of us turned out for the last Tuesday 3* of the season on a cooler but nice riding evening. A little too big for one group, we split into two for a fairly fast (24kph) first leg to Uffington. All riders in my group, kept up a good pace whilst managing to maintain healthy conversations ! Thanks to Eddie for leading the second group. The groups merged on the ascent of White Horse Hill with a fight for the polkadot jersey seemingly between James, Andy and Louis - I was too far back to see who claimed it! The sun was visible on the climb only to disappear when we reached the top. That didn't stop stem the enthusiastic mood as the photo demonstrates! A swift return the way we came along Baulking Lane and back to Grove as the light was beginning to fade. A lovely way to round off the season. Thanks to all.